QUICK COURSE DESCRIPTION: QUICK COURSE DESCRIPTION: How to create gripping, compelling scenes that use characters, location, and conflict to keep your reader turning pages from story start to the very last page. You can create wonderful characters, build great worlds, and plot like a fiend, but if you can’t write page-turning scenes, you don’t have a book. You want to keep your readers hanging on your every word, but every time you relax your vigilance, your characters start lounging around, talking about the weather, drinking coffee and leaning against walls. Or perhaps you get fascinated by your own worldbuilding, and when you look up from writing, you discover what you've done is a twenty-page infodump. Maybe your scenes race by so fast that when you read them back, you find the barest sketch of the picture you had in your head while you were writing. Or just maybe you haven't got the hang of doing scenes yet at all. Every one of us who writes for a living started with all of those problems and a host of others. And every single problem is fixable. In this course, you'll write your way from the simplest of scenes to the most complex. You'll start building with basic scene blocks, write short, compelling practice scenes, and add complexity as you go. You'll learn how to avoid common pitfalls, find the excitement and conflict in each scene, and write just the important parts. And you'll have fun working through this. Which Of These Essentials Are YOUR Scenes Missing? And it includes a short essay with the hard, cold math behind why you NEED to write what you LOVE to write. Thousands of students have now taken this course. Many have recommended it on Amazon.com, BarnesAndNoble.com, and elsewhere. "If your story is great but your scenes seem boring and dragging, this is the book to read. It is fun to read and easy to use. If you do the suggested exercises your story will improve so much you won't believe it." "This is a fabulous book on the art of scene creation, and raising the stakes to make every scene conflicty and juicy. 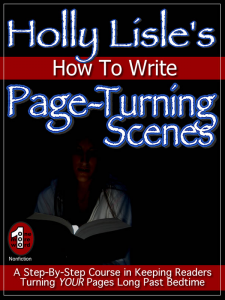 Holly takes a couple of chapters to give a working definition of a scene, and to define the different types of conflict (complete with exercises to practice the different types), before moving on to things like the art of storytelling through scenes, pacing, transitions and trouble-shooting for common problems. ... Practical, easy to use, lots of exercises. I really like Holly's non-fic work on writing, and her style resonantes with me, so I usually find her books helpful..."
"...I started writing my novel in 2006 and quite frankly suffered thru most of it. I had bought and read over a dozen different books on fiction writing. Some helped, most did not. It was not until the summer of 2012 that I ran across Holly's website. She is exactly what I have been looking for in a writing coach. It is her style and knowledge that just resonates with me to such a degree that she took all of my FEAR away about what to do, when to do it and how long to keep it up. Her "How to write a series" is equally mind blowing for me as a new novelist. I highly recommend them and I will end up purchasing all of her works as I continue to build my craft...."
And here's a quote from one of my pre-publication beta testers. You answered my questions, and even answered questions I hadn't thought to ask. :-) This course really put a lot of things together for me. I could almost hear the 'click' in my head when it all snapped into place. I am blown away by how much that course showed me in just a few days. Whatever you plan to charge, it is worth more! I don't mean that any specific thing you said was a surprise to me. Instead, it was the way you put it all together, and showed how to make it work. You covered points I already technically knew, and have been using, but showed me how to use them right. The only way I can describe it is that my mind feels like a tool whose edge had been dull and rounded, and the course acted like a sharpening stone and put a nice, keen edge on it so it can get right to work. Before I started the beta-test, I'd been looking over some old, unfinished novels, trying to decide how to fix them. I had some fumbling, not entirely bad ideas. Then, I sat down and ran through the course, and now I have much better ideas of how to whip them into shape. When I looked them over after I reviewed the course carefully, there was a noticeable difference in how easily I could spot problems and plan solutions. I've designed this course to be simple and straightforward, a step-by-step walkthrough that takes you from never having written a scene (or never having written a scene that's sold) to writing complex, multi-layered scenes that will engage all your reader's senses and keep him glued to his seat and enchanted by your story. I've skipped theory and fluff in favor of practical application. I've created short, to-the-point exercises that will give you hands-on experience with every critical technique in the course. I've used my own experience to present those facets of scene writing that I have found essential to getting and staying published through my many years of doing this full-time (I went full-time in 1992) and through my 30+ novels sold. You expect to improve your writing by reading about writing, instead of doing the actual work. It won't happen. The only way to write good, salable words is to write a whole lot of bad, unmarketable ones first, and to learn by doing. If you're hoping to learn to write scenes by osmosis, save your money. You want a magic bullet to make your work sell. It took me seven years and more than a hundred rejections to make my first sale. After that, they came thick and fast, but the closest thing I have to offer you in the way of magic bullets is this advice. "Persist." If you're willing to put in the work, though, I have given you the very best tools in my writing arsenal to get the job done. ...in the next five minutes. Writing novels is a great job—I'd call it the best job on the planet, but I'm biased because it's my job. Still, if someone can love her work after more than a quarter century of doing it, you have to think there must be something special about it. If this is the job you want, I'm thrilled to do what I can to help you get it.